In 2016, Abhayjeet looked out at an expanse of icebergs stretching out for kilometers in front of him. He listened to them crash and melt into the sea. He was 14 years old and experiencing the effects of climate change first hand at the UNESCO World Heritage Site in Ilulissat, Greenland, thanks to a $12,000 U.S. Embassy scholarship. Abhayjeet was the youngest of 120 students from across the world chosen to take part in the 2016 Students on Ice Arctic Expedition. Nature is the ultimate connector of humanity. We are all a part of it and affected by it regardless of other borders that divide us. Abhayjeet has understood and felt this connection from a very young age. His family moved to Canada from India when he was 11 months old, and he still reflects fondly on his experiences in nature as a child in Canada. He particularly enjoyed spending time at Watershed park. When Abhayjeet was six years old, he visited India and was shocked by the waste and pollution he saw there. This caused him to develop a greater appreciation for the environment and wild spaces back home in British Columbia, and instead of being discouraged, Abhayjeet was inspired to take action. He began to educate himself about the effects of climate change and think about ways he could make changes in his own life. He started talking to teachers about recycling. Only he didn’t stop there. He began with discussions in his school and community and is now in the processes of taking the conversation to an international level. Abhayjeet has understood since childhood, that change starts with a conversation. In elementary school he discussed issues such as climate change with his parents and teachers. He was then inspired to organize community clean-ups, fundraisers and preservation initiatives. He took a leading role in his school’s environmental club and developed a community rain garden to educate others. Through the Delta Youth Sustainability Network, he began giving presentations at local schools to connect with other students and inspire them to work collectively. 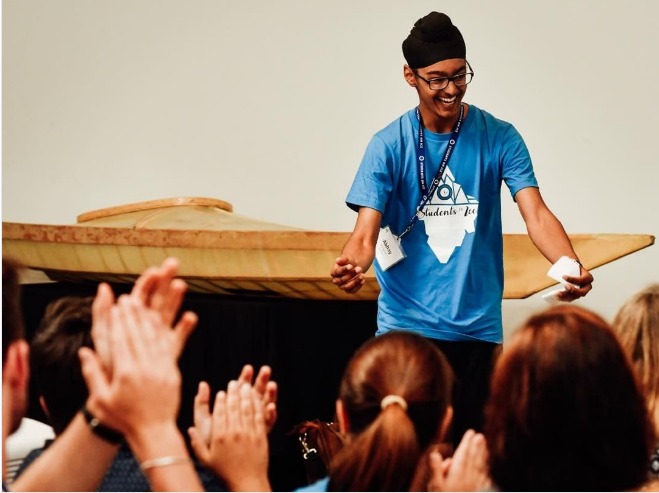 Despite the magnitude of the melting icebergs he saw on the 2016 Arctic Expedition, Abhayjeet was most inspired by the connections he made with Inuit students during the trip. He was moved by their stories on how climate change is directly affecting their way of life and contributing to the epidemic of suicide happening in Inuit communities (where suicide rates are 11 times the national average). From these interactions, Abhayjeet began to understand that climate change is not strictly environmental but also physical and social as well. This motivated him to found the organization “Break The Divide” to connect youth from across the world and enable them to share their own stories of the role climate change plays in their lives. The organization has begun by connecting students in Delta, BC with those in Inuvik, Northwest Territories through video calls. Abhayjeet continues to expand “Break The Divide,” giving presentations in classrooms from Delta, B.C. to India. He was the keynote speaker at the 2017 Richmond Earth Day Youth Summit. Next, Abhayjeet would like to expand the organization internationally and encourage youth to take an active role in mitigating the effects of climate change in their communities. He is looking at France and Japan as starting points. Abhayjeet has used his connection to nature to inspire connection between students across Canada and the world, and - as he puts it - “connection is power.” Abhayjeet would like to thank his teachers for initially giving him the confidence to take action and his friends, family, and other students for their continued support.